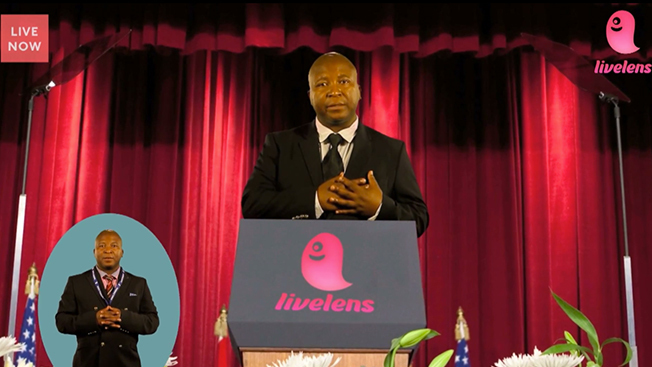 A new, poor taste LiveLens ad featuring Thamsanqua Jantjie, the sign language interpreter who rose to infamy when he faked his way through Nelsen Mandela’s funeral, has outraged online viewers. Angered individuals felt that Jantjie's actions poke fun at the method of communication that many people in the deaf and hearing impaired community rely on. On top of having an overall negative rating on YouTube, many Twitter users have photographed their hands with the words "Stop #FakeInterpreter" in order to protest the ad. A LiveLens company spokesperson said that it got the idea to use Jantije in its ad campaign after watching a Saturday Night Live skit about his fake sign language interpretation. LiveLens, which launched its app in the U.S. on May 1, is a social platform that allows users to livestream video from their smartphones or tablets to another device. "We thought, what better way to promote our live streaming app than with a man who became infamous for his own live performance," the rep told Adweek. In order to film Jantjie, the rogue interpreter was signed out of a South African mental institution under the guise of attending a family wedding. The LiveLens spokesperson denied that the company itself "broke him out," and clarified that it hired a local professional to find Jantjie. LiveLens didn’t anticipate the backlash it would receive. It has not yet been determined if Jantjie will be signing on to any other campaigns for the company, the spokesperson added.